The King's Arms Dalbeattie is a small hotel with so much to offer. Behind its impressive granite façade, a warm welcome awaits local residents and visitors alike. The hotel has been owned by Rhona Wixon since 1999 and has been renovated to the very highest standards over that time. 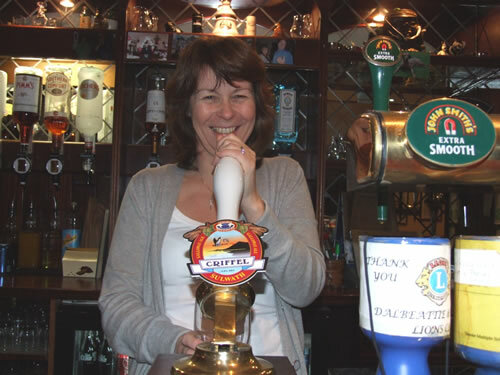 Rhona has many years' experience in the hospitality industry and is a former Dram Bar Personality of the Year finalist. The staff take great pride in all that they do which is why so many of our guests return regularly. We are also recommended on Trip Advisor - see our reviews. We look forward to welcoming you to The King's Arms Hotel. Book your stay today. Call us on: 01556 610400 or click here to email us. Rhona Wixon, owner of the Kings Arms Hotel, Dalbeattie. "Fourth stay here. Looking forward to the fifth"
Extremely friendly and welcoming staff, clean room and bed linen, spotless bathroom and shower. Excellent evening meal, very reasonably priced. Good, hearty breakfast. See more guest reviews.